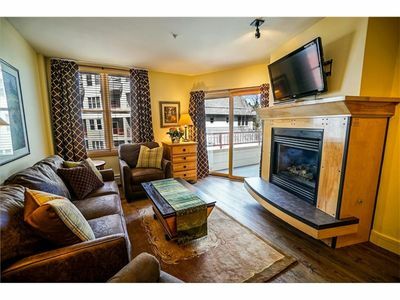 This condo is the best Ski-In, Ski-out location at the Breckenridge Ski Resort! 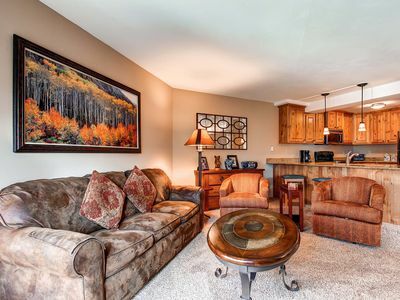 Spacious, airy, & clean, this bright Breckenridge, Colorado, condo feels like home the moment you walk into it. With over 710 sq. 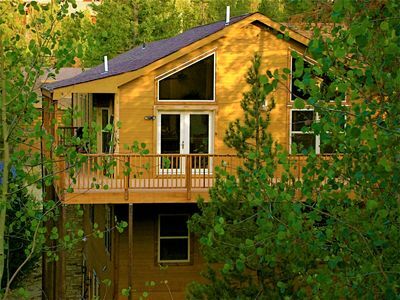 ft. of living space (66 square meters), it's much larger than most 1-bedroom condos in Breckenridge, which average 500 sq. ft. (46 square meters). If you're a skier or snowboarder, you'll love renting your equipment at Charter Sports, located next to the Snowflake Chairlift (across the street from our condo). Also across the street from our condo, you'll find the Breckenridge lift ticket booth. Order your lift tickets ahead of your vacation, then pick them up at the ticket booth across the street from our condo on the first day of your vacation -- so convenient! 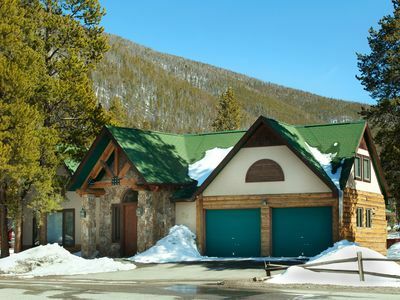 A Spa also is located in this building across the street from our condo: the Spa at Breckenridge offers Swedish Massage, Hot Stone & Deep Tissue Massage, body wraps, facials, nails, waxing, & more. 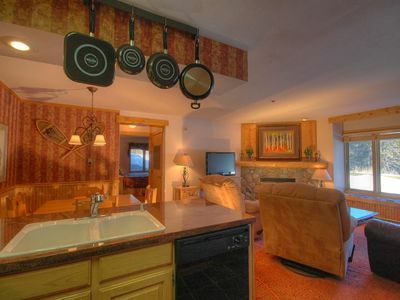 Our condo is only 3 blocks from Main Street in Breckenridge, the heart of town, with many shops & restaurants. If you prefer not to walk 3 blocks, you may reach the town's shops and restaurants by rental car, or via the free shuttle bus that picks you up and drops you off in front of our condo. 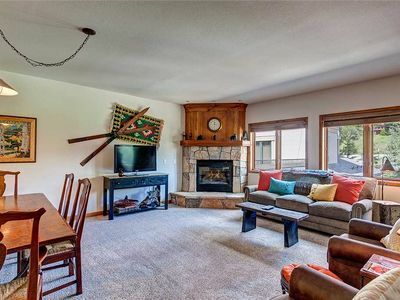 This home has a ground-level entry, with no stairs to climb or hallways to maneuver and it's steps from the parking lot. 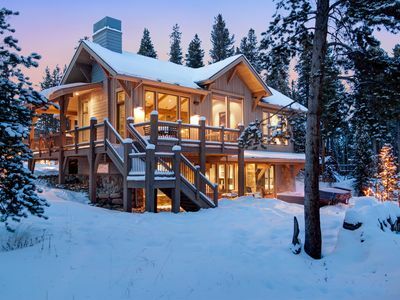 It's easy to unload coolers, skis, and gear: park your car right outside our front door. (We've always preferred that to having to drag our luggage through a lobby, up an elevator, then down a long, dark hallway.) This is easy unloading! 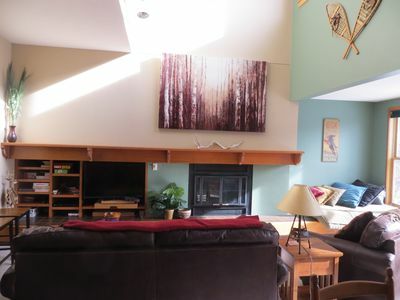 Our sunny east-facing living room provides a dramatic stone-accented gas fireplace that makes this home warm and cozy & turns on with the flip of a wall switch. Nearby, a brand-new flat-screen TV with remote provides oversized TV viewing of over 75 channels, including 4 HBO channels & numerous sports stations so you won't miss the big game. (The bedroom has a second flat-screen TV!) There's a leather sofa with a Queen-sized bed in it, including an upgraded memory-foam mattress. Two of the world's most comfortable recliners allow you to relax after a fun day of skiing, biking, or shopping! 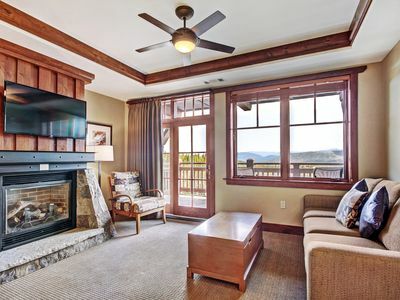 Plus, you'll enjoy gorgeous views through our large windows that look over the valley to the mountains surrounding Breckenridge. The open kitchen provides views into the dining area & living room. The kitchen offers upscale granite countertops and a breakfast bar highlighted by recessed can lights. It's fully equipped with microwave oven, full-sized refrigerator, smooth-top electric range, full-size oven, & automatic dishwasher. The dining area seats four comfortably, with two bar stools at the granite-topped breakfast bar providing additional seating. 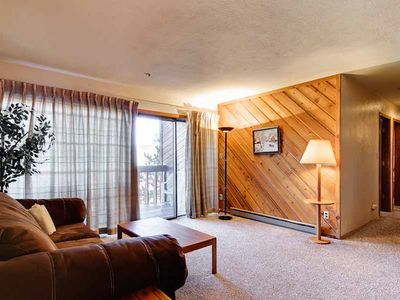 The spacious, sunny bedroom boasts two large windows, a new king-sized bed with a plush luxury mattress, large dresser, oversized desk, walk-in closet, and a second flat-screen TV with remote. Bring your laptop or smart phone or I-pad and use our complimentary WIFI (available through the condo complex). 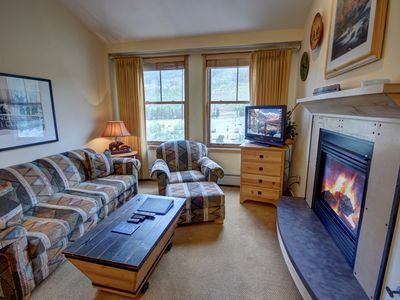 The condo comes with a washing machine and tumble dryer which are located in our home, in a closet near the bathroom. If you're attending a wedding in Breckenridge, you can use our iron and ironing board; otherwise, don't bother! Nobody dresses up in Breckenridge -- not even for dinner! This is a resort town intent on allowing you to thoroughly enjoy your vacation! The newly remodeled bathroom includes bathtub, shower, toilet, & sink with an oversized vanity, mirror, upgraded lighting, & upgraded tile walls & floors. 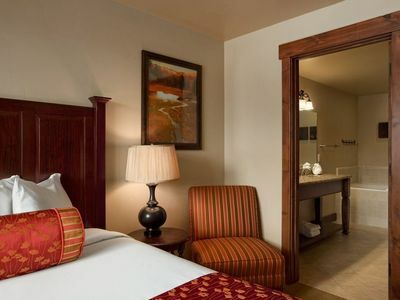 Naturally, we provide fresh linens for the King bed & Queen sleeper, plus bath towels & hot-tub towels for 4. 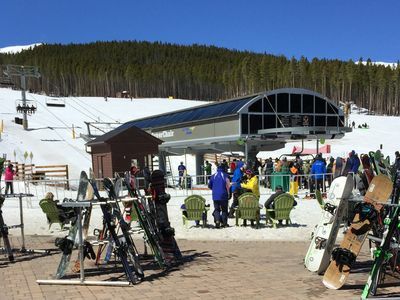 Did you know that Breckenridge Lift Tickets also are good at Keystone Ski Resort? We think Breck is best, but night & day skiing & snowboarding also are available at nearby Keystone. 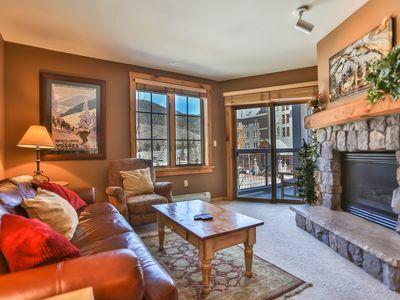 Stay at our Breck condo and you'll be able to ski in, ski out of the Breckenridge Ski Resort 1 day, then drive approximately 20 minutes (or take the free bus!) for a day of skiing or snowboarding at Keystone if you want! You'll fall in love with the charming & authentic mining town of Breckenridge; it blows Keystone out of the snowbank! 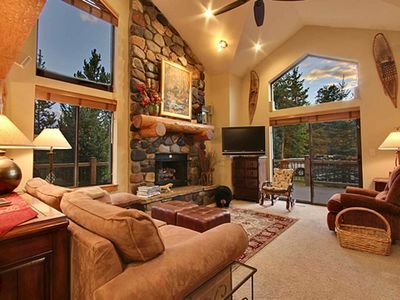 So instead of lodging in Keystone, stay in our condo -- it's only 3 blocks from downtown Breckenridge. 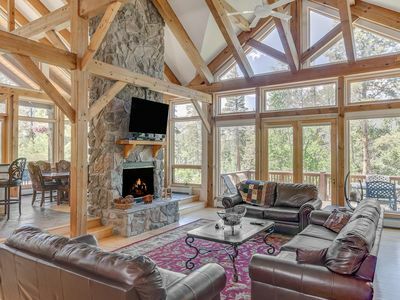 From our rental home you can drive approximately 35 minutes to the famous town of Vail and its famous ski resort, which is at a lower elevation than Breckenridge Ski Resort -- so spring skiing is best at Breckenridge because our snow stays colder! 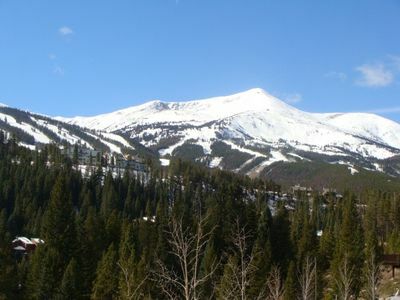 If you want to see spectacular mountain views, take the Imperial Chairlift at Breckenridge Ski Resort to the top of Peak 8: it unloads at 12,840 feet above sea level! (3913.6 meters above sea level!) This fast quad lift, the highest chairlift in North America, is for black diamond skiers only! But if you're a beginner or an intermediate skier you'll love all of the beautiful acres of ski trails (155 runs total) that are geared for your ski levels at Breckenridge! In summer and fall, you may ride up select chairlifts at Breckenridge then walk or ride your mountain bike down! 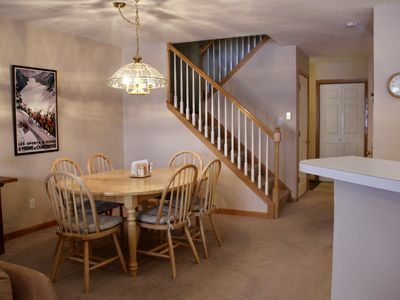 You'll love the luxury and convenience of this appealing condo! For pricing, click 'View Rate Details.' Check our calendar for available dates -- we fill up fast each ski and summer season! 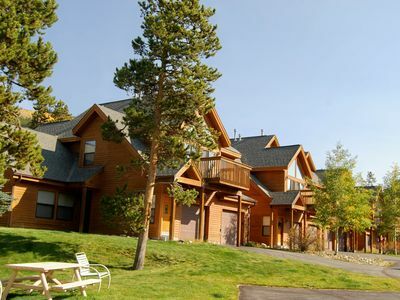 Don't forget the summer celebrations at Breckenridge: July 4th includes a gorgeous -- huge! -- nighttime fireworks display; Breckenridge Oktoberfest; August's Stage 5 of the Pro Cycling Challenge in Breckenridge; and free summer concerts in Frisco, CO, 10 minutes away! In summer, walk the beautiful trail 3 blocks to the secluded lake, to fish for Rainbow trout. There's so much fun outside our condo door, there's not enough space to describe it all! Keywords: Breck Condo, Breckenridge Ski Condo, Colorado Ski Rental, Short Term Lease, Mountain Condo, ski in ski out condo, Keystone condo, Vail condo, Vail vacation, Colorado holiday, Stage 5 USA Pro Cycling Challenge, Pro Cycling Challenge, ski condo at Dew Tour Breck, Dew Tour Breckenridge rentals, Breckenridge Dew Tour ski condo, Imperial chairlift, North America's highest chairlift, Vail ski vacation, Breckenridge golf, Vail golf, mountain homes for rent, vacation in Breckenridge, vacations in Frisco, vacations in Vail, vacation rentals in Keystone, USA Pro Challenge, USA Pro Challenge Breckenridge, USA Pro Challenge Vail, Beaver Creek, USA Pro Challenge Stage 5, Breckenridge Film, Breckenridge Oktoberfest, NRO Chamber Orchestra, Breckenridge Music, Frisco Summer Concert, Breckenridge weddings, Summit County. Advertised rates are posted a year in advance. Reservations requested further in the future may not be quoted properly. The BEST! 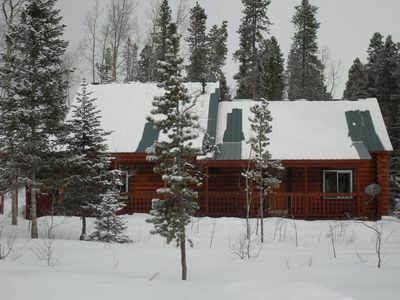 BIG, BEAUTIFUL LODGE - 2 FULL UNITS - GAME ROOM - LOADED!